Elmos World Standard Castle, everyone’s favorite Sesame Street Muppet, can teach young guests the excellent bouncing skills in this licensed Elmos World Standard Castle. This jumper’s artwork has Elmo laughing and having a great time in his world, with plenty of crayons to create a magical space. Kids can bounce along with Dorothy the Goldfish as well! With two three-dimensional depictions of Elmo flanking either side of this tremendous jumper, guests are sure to stop and see what Elmo is up to! 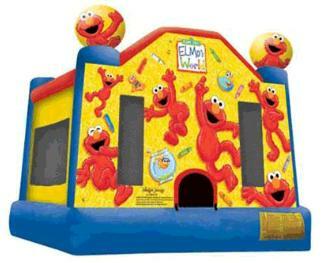 This medium Elmo’s World jumper also comes in a larger size, and is part of a licensed line of colorful, interactive inflatable products from Elmo’s World and the folks at Sesame Street. Jumpmaxx Loves to WOW you so we bring to you our customers great Jumping Castles. Everyboady Loves Elmo Big kids Small Kids they all will be fasinated by Elmos World .Just add Kids For Great Fun.